Ryan Hyman, our National Director of Development, spent the day in Houston, Texas meeting with new Ezer Mizion friends at Congregation Beth Israel’s “Israel at 70: Reaching Out to the World” event. Ryan shared the Ezer Mizion story and showed a video of one of our bone marrow recipients meeting his bone marrow donor for the first time. The video was highly emotional but even more impactful was when Ryan introduced the bone marrow recipient who is a resident of the Houston community. 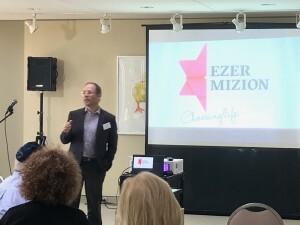 Attendees were visibly moved as the recipient told his story and implored everyone present to support the important work of Ezer Mizion.